return to VR/AR/360 video, mixed reality and immersive media. The talk will connect some of the current key trends of critical consideration of immersive media and trace connections and disconnections relevant to the VR decade of the 1990s. This talk introduces the basics of early VR history, including the people and inventions that enabled it. I define what fully immersive VR means and look at the factors that support full immersion. I also feature a deep dive into the most creative projects from 1985-2007 and explore the role women played in creating the majority of them. The talk also touches on why VR did not reach more commercial success in the first wave of its use. I explore today’s resurgence of VR technology made possible by sophisticated desktop graphic computers and lower cost gear, and outline new techniques and concepts that may help VR be more successful this time around. This paper considers the status of the body as we journey deeper into technological territory. The body is at the center of a multiplex system of intersecting realities. Our physiology, memory, imagination, dream space, and subconscious is informed by our sense of touch, taste, smell, sight, and sound. Our mental, psychical, and physical abilities imply that each of us presides over a powerful intelligence that is vested in the body. What do we actually know about our own body? How is digital technology shifting the value of the body? Has the body been monetized, and if so, what options do we have to take back our body? Why does it matter now? Keywords—body, subconscious, reality, ethics, ecology, Tshirt, fashion, technology, health, economics. The sense of smell and naturally occurring odors in the environment are part of a chemical framework that encompasses the natural world and plays a role in every facet of human life. The chemically mediated senses of smell and taste allow us to obtain meaningful and objective information about the world. These chemical interactions play a primary role in structuring our thoughts, memories, and broader consciousness. We sense the external world through internal neuronal representations in the brain. Because of olfaction’s unique attributes, many commercial entities are now attempting to integrate odor cues into artificial communication and entertainment environments such as Augmented Reality and Virtual Reality (VR/AR). The addition of scent is having a substantial impact on the magnitude of immersion that is experienced in AR/VR; however, little is known about the collective emotional and psychological impact of odor stimuli as more and more people come in contact with virtual systems, nor has the safe, ethical, and sustainable use of these aromatic compounds been established. The aim of this paper is to suggest a strategy for identifying the most promising and safe raw materials to integrate olfactory information into AR/VR and other technology and communication systems. To address this, I draw on my ethnographic research to create and scientifically contextualize a chemical art object, World Sensorium, consisting of a world scent composed of culturally associative aromatic compounds derived from select plant species from around the world, to provide insight into how the evolution and qualitative character of the human olfactory experience that has shaped the global cultural sensorium. 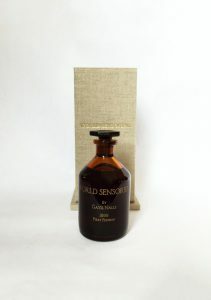 Through World Sensorium, olfaction is explored as a medium of memory, communication, and emotion, to create an artwork that has positive meaning for a vast number of people across the globe. Each chemical constituent in this world scent is associated with unique neural imprints that are central to the transmission of cultural and aesthetic values. Furthermore, and of critical significance, the paper suggests that aromatic chemicals introduced into VR/AR scent environments ought to be cautiously evaluated for their impact on their users as well as on broader human health and the environment. This work is concerned with physical nature of embodied human experience of the natural world with memory as it’s underpinning. World Sensorium is comprised of the botanical material of plants that have risen to the highest cultural status in an evolutionary adaption of the human brain and the natural world. Smells are culturally specific, so different countries perceive scents in different ways. Each scent stimulates the brain in a unique way and provides shared feelings among the population expressed as regional culture. The research was conducted on an official basis through country governments around the world and identifies iconic aromatic plants that work as olfactic cultural memory triggers for the majority of people of each country. Just as flags and anthems are symbols of national culture, the research revealed that certain natural smells are emblematic, representative and characteristic of country cultures. World Sensorium is an olfactory social sculpture, a single composition, composed of culturally associative aromatic phytogenic materials of the world’s flora and formulated with the botanical materials’ percentages corresponding to each country’s population size. In the final scent, the world is united as one in a botanical biosynthesis comprising the plants most important to humankind’s evolution within the natural world. World Sensorium stemmed from Permutatude Theory, that evolution of social attitudes are based on the flow of information related to the amount of information technology per capita in each country. The world scent was created for the Aesthetic of Mass Anatomy to evoke global memory and to evolve a metabolic collective through sensorial embodiment. World Sensorium reflects on the role and interplay of population dynamics, the physical properties of our environmental community, and our emotional, perceptional, memory, and cognitive processes. Wherever we are born in the world there are smells that reach us beyond our conscious attention and construct an intimate understanding of place within us. Smells of trees, flowers, plants, herbs and grasses further correlate with scent-rich cultural practices that have evolved a form of intelligence, and in some cultures, word-specific smell vocabulary. When an individual senses these iconic smells again, they evoke memories bound with specific singular and cultural references. Smell is intricately linked to memory through the limbic system, and when triggered, a flood of associative memories arise that influence both mood and emotions. The study for the artwork’s creation started in the mid-80s and surveyed world countries through official channels until the late 90s to identify dominant natural aromas retained through odor memory. The study established that there are highly associative natural scents that work as olfactory imprints and memory triggers for large numbers of people of cultures in every region of the world. In a letter from UNESCO dated 5 September 1998, The United Nations Educational, Scientific and Cultural Organization’s Director General Federico Mayor (serving from 1987–1999), a brain biochemist and scholar, reviewed and endorsed World Sensorium as a ‘truly international experience leading to better understanding and collaboration among the nations’ contributing to ‘creating a climate of goodwill and peace.” (UNESCO Letter reference: DG/22/138). World Sensorium premiered at New York’s Times Square 2000. As the New Year arrived, paperworks (visual vehicles containing the olfactory sculpture) cascaded down with the confetti into the resonance of two million people, evolving a metabolic collective. The same year, World Sensorium, was also featured in Washington, D.C.’s Millennium Around the World gala and the Vatican’s Millennium Jubilee in Rome, Italy. It has since been exhibited in galleries, museums and public spaces internationally. World Sensorium’s composition is comprised of a mixture of essential oils and other botanical materials with their percentage volume each representing an individual country’s population size and the most culturally significant scent of that country. However, the volume of an ingredient does not equate to the odor impact or odor threshold. The most prevailing scents in World Sensorium by volume are: Jasmine, Sandalwood, Rose and Pine. The most prevailing scents by odor impact are Birch and Tobacco. World Sensorium was the conceptual answer to hypothetical questions such as: Why are we all on earth together? Can we tap our natural empathy for each other for the common good? If our behavioral nature comes out of our biology that evolved with nature… is there an answer in nature? Are there principles there to help us transform our awareness that we are part of a global community, not only with other humans, but with all life? Published as an early interdisciplinary project (art/science) in the work titled The Importance of Natural Olfactory Stimulation on the Perception of Well-being and Happiness: A Global Investigation, and was presented at the conference Linking Affect to Action: Critical Contributions of the Orbitofrontal Cortex at New York Academy of Sciences in 2008. This World Sensorium research has also been included in the book by the same name. World Sensorium is composed primarily of the essence of plants that effect mental, physical, emotional and spiritual experience. The research revealed that the flora that has risen to high cultural status did so because of their chemical constituents that contained healing properties. World Sensorium is highly medicinal. The creation of the concept has already initiated a unifying consciousness, with the thought that the distinctions between cultures will be blended, shared and “resolved.” Vietnam sees World Sensorium as “a reconciliatory act,” the “taking and sharing of the best of what every country has to offer.” The ethos of the project was that everyone on the planet was counted and their numbers represented. Nature’s most powerful way to prove identity is through smell. World Sensorium, as a one-world olfactory sculpture, is a convergent approach toward increasing humanity’s understanding of itself, fostering global cooperation, dedication to the environment, and to preparing us to live a more effective future in peace.